Over the past year, we covered the Top 100 Coolest Houses in Minnesota in two separate installments. The historic beauties all over the state ran the gamut in terms of architecture, sizes, locations, and styles, but there were just so many that I couldn’t squeeze into the Top 100, no matter how much I wanted to include them. So here are the next 50! 150. 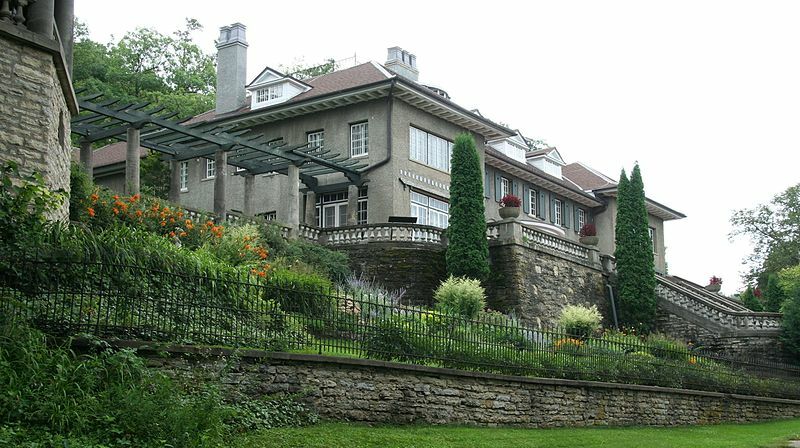 Mayowood Mansion – Dr. Charles Mayo, the co-founder of Rochester’s world-famous Mayo Clinic, had the Mayowood Mansion built outside of town on a lush, green, hillside overlooking the Zumbro River in 1911. 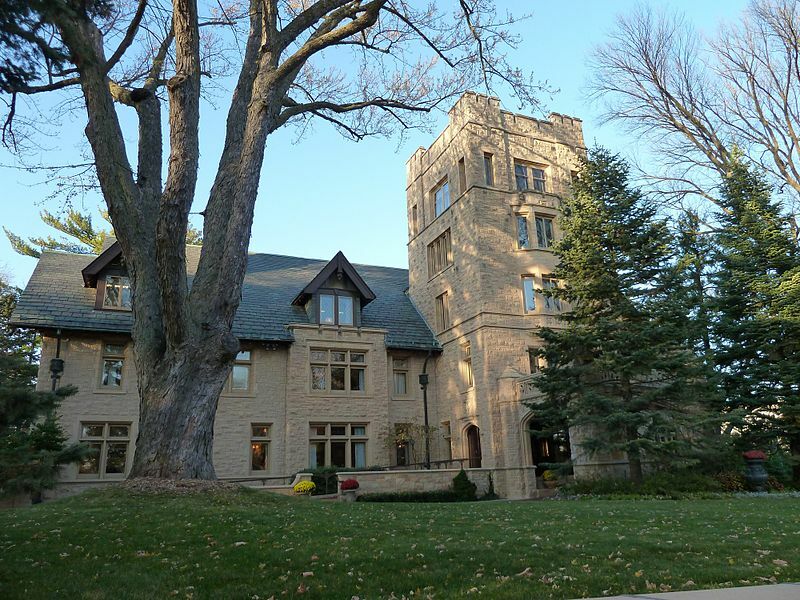 With over 38 rooms, European and Japanese-influenced gardens, dragon-tooth fences, limestone walls and stately steps, the grand Mayowood estate is one of the largest homes in Minnesota. It is now operated by the Mayo Foundation (after it was donated to Olmsted County in 1965). Visitors can tour the mansion and grounds for a fee. 149. 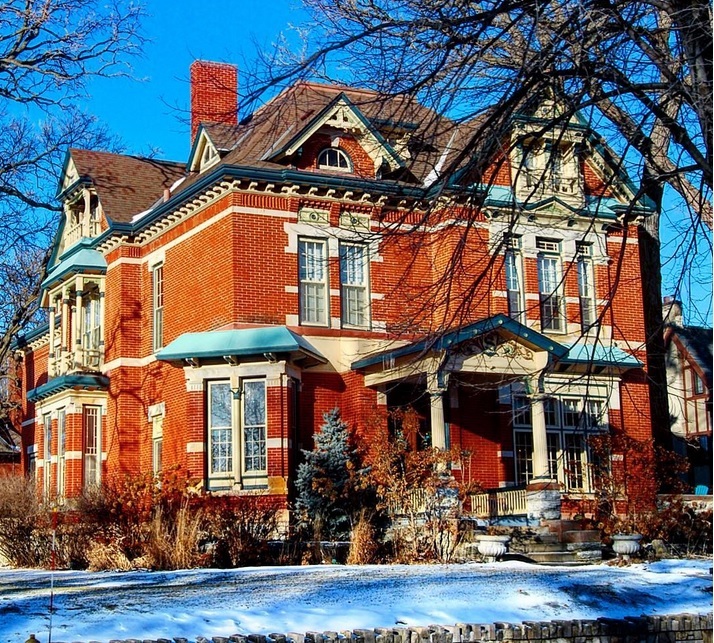 Van Dyke-Libby Mansion, Hastings – This French Second Empire-style home in historic Hastings was built in 1868 by William J. Van Dyke, a local banker. It was later sold to Robert Libbey, owner of a local sawmill. In the 1900’s, it was home to a sanitarium for a period until it was later divided into rental units, as it is today. It is listed on the National Register of Historic Places. 148. 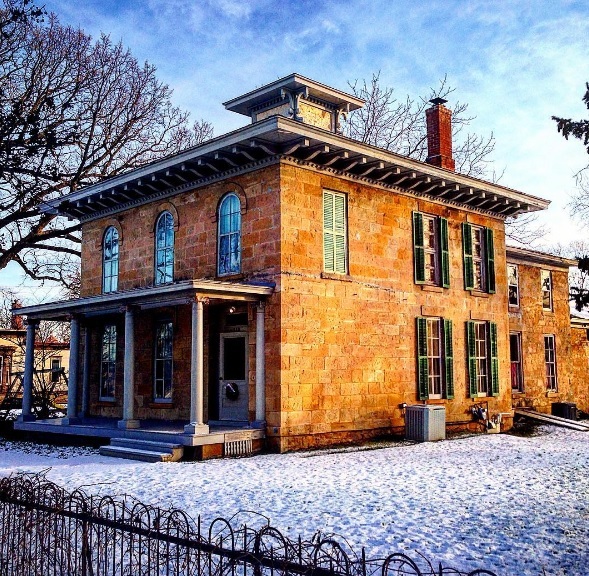 Joseph Eichten House, Stillwater – The historic rivertown of Stillwater is often referred to as the prettiest city in Minnesota, due to its winning combination of dramatic scenery and historic architecture. 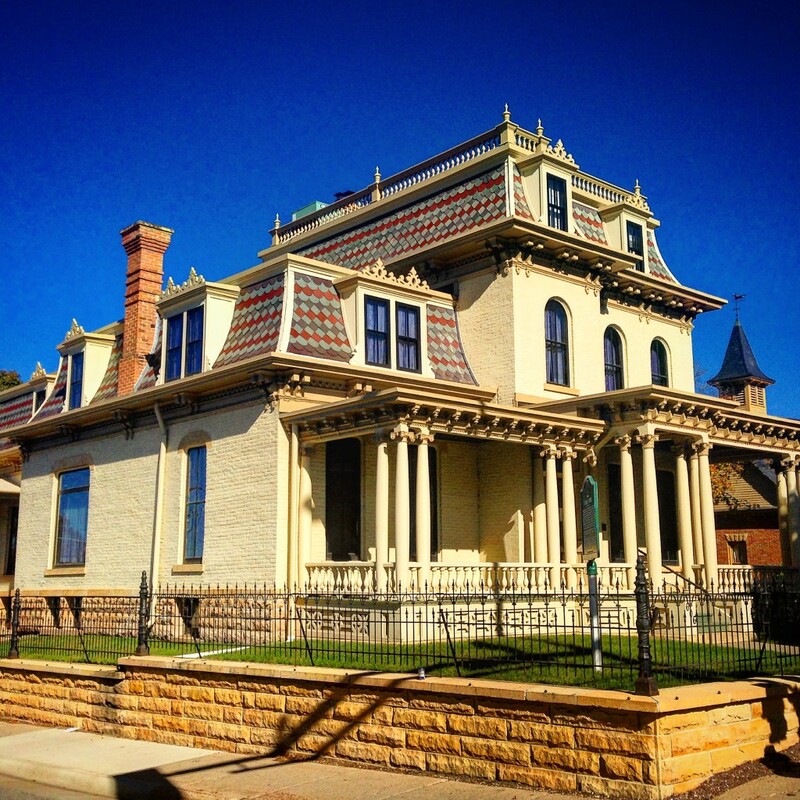 Many of its countless Victorian homes ended up on our Top 100, but there were many like the historic Eichten House near Stillwater’s lovely courthouse that deserved a nod. 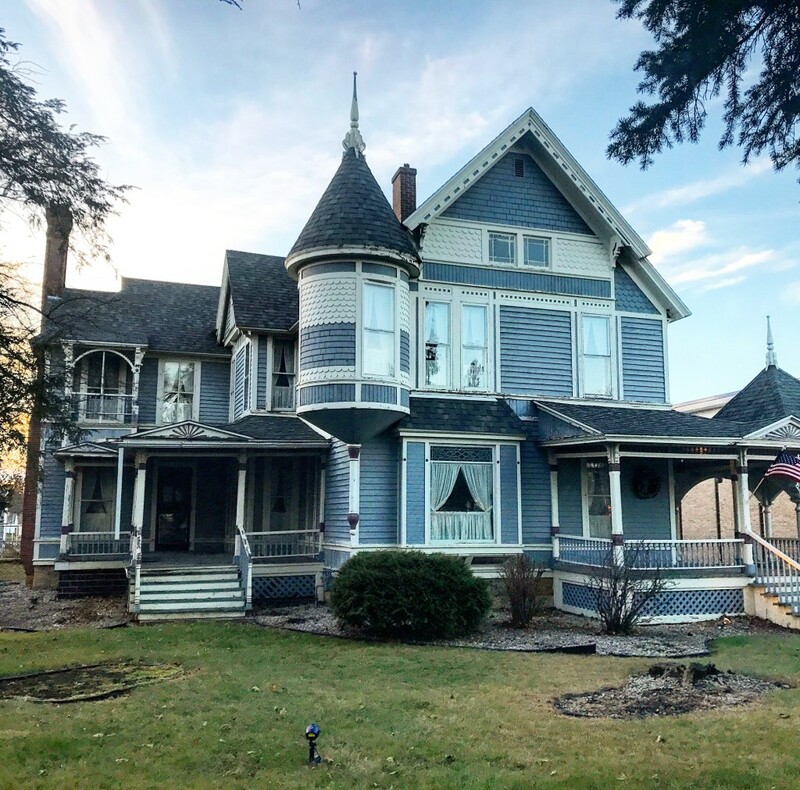 Featuring a two-story turret with fish-scale shingles and a sunburst panel, a wraparound porch, and multi-colored trim on each gable, the home was built in the late 1800’s for Joseph Eichten, a liquor wholesaler and business owner in Stillwater’s early days. 147. 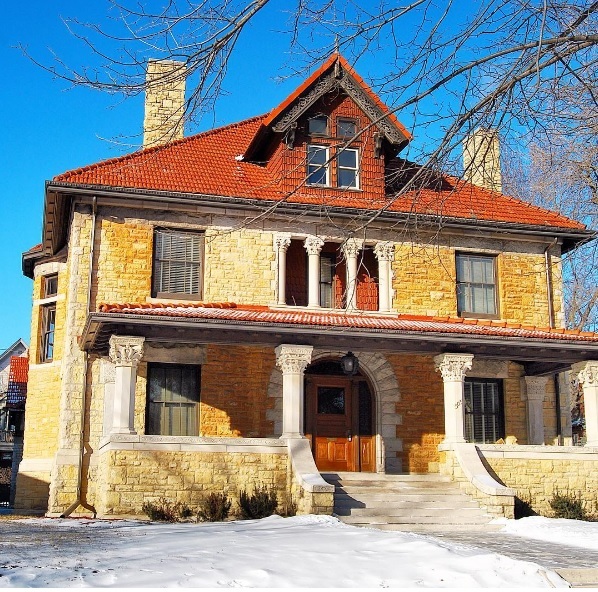 George Freeman House, Summit Ave, St. Paul – With a combination of Romanesque and Renaissance styles, the Freeman House, sometimes referred to as the Kroeger House, was built in 1896 by architect Cass Gilbert. This famous architect built several other homes in the area and also designed the Minnesota State Capitol building. George Freeman was a successful salesman, business owner, and real estate developer. 146. Olcott House, Duluth – The grand Olcott House in Duluth’s East End neighborhood is a Georgian Colonial-style home dating back to 1906. John Olcott made his fortune in the neabry iron mines, and was also president of the Duluth Missabe Northern Railroad for many years. The mansion has remained mostly unchanged over the last millennium and is currently a Bed & Breakfast. 145. 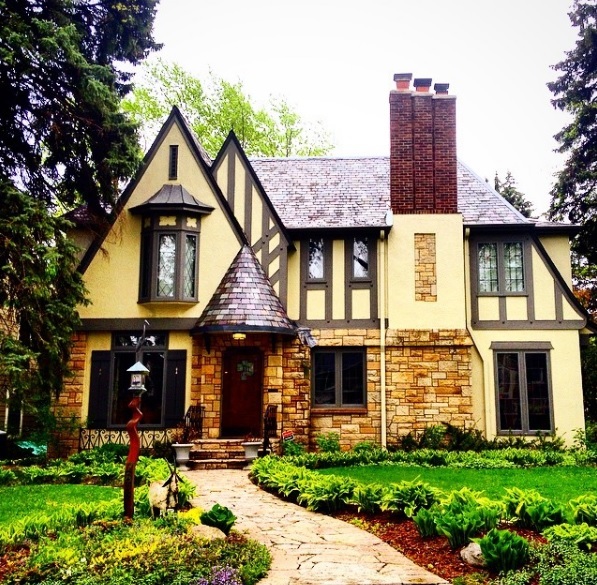 Tudor style House, Minneapolis – There are countless beautiful homes in the Twin Cities that could have ended up on this list, but this Tudor-Revival style home near Lake Calhoun was just too good to pass up. 144. 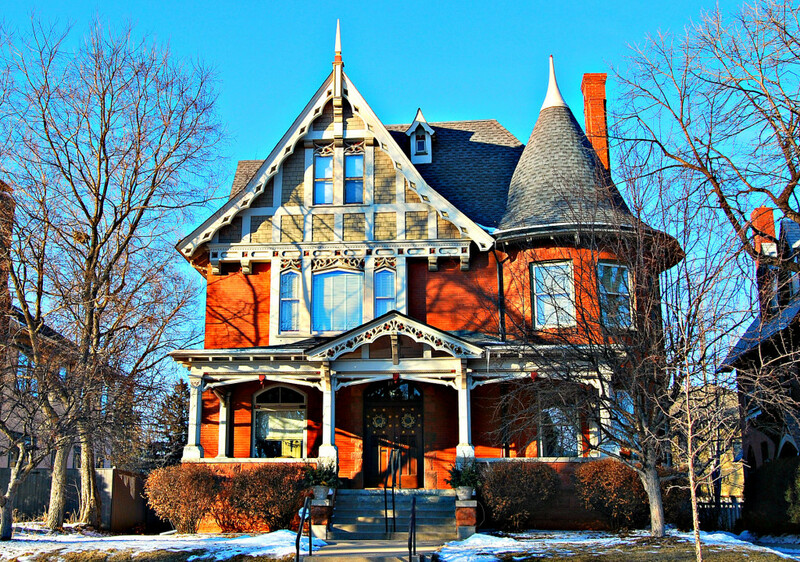 John R. Funk House, Carver – This classic Queen-Anne style Victorian home in the little gem of a town was built in 1900-1902 by John Funk Jr., the son of one of Carver’s settlers. Funk was a successful businessman and politician in Carver’s early years. The four upstairs bedrooms in the home are all constructed with different types of wood and designs. 143. 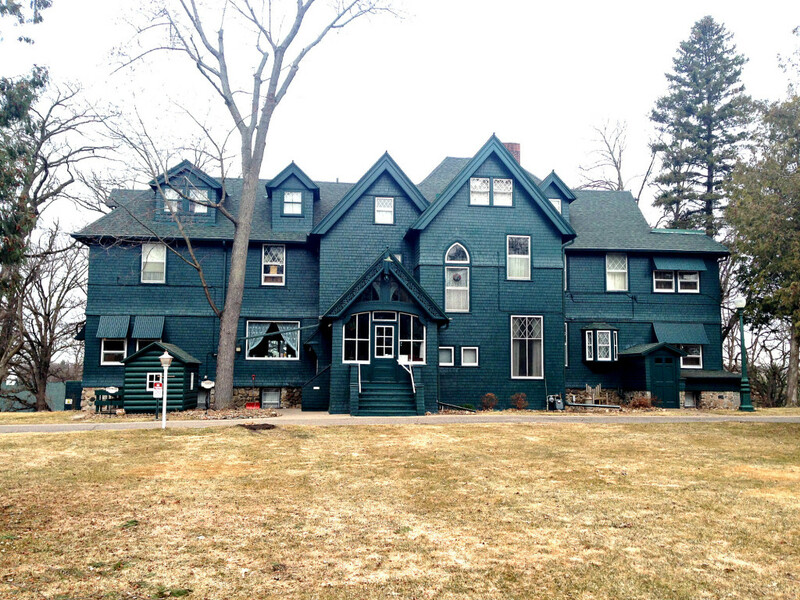 Prospect House, Battle Lake – Battle Lake’s Prospect House was originally an Inn dating back to 1887. It was later converted to a private home and in more current years is in use as a Civil War Museum. The home was designed off of drawings of the original owner’s property in Chicago, in the Georgian Revival style of early American architecture. 142. Thomas F. Cowing House, Alexandria – A rare example of early Gothic Revival-style cottages in the lakes area, the Thomas Cowing House in Alexandria is one of the oldest intact structures in Douglas County. It stands in a residential area in town and dates back to 1875. It is currently a private residence. 141. Cotton Mansion, Duluth – The Cotton Mansion in Duluth’s historic East End mansion district was built in 1908 in the Italian Renaissance-style of architecture, featuring a hand-carved marble portico, Classical-designed straight bracketing, and classic yellow brick. This home is now a Bed & Breakfast. 140. Mayo House, Rochester – Now home to the Mayo Foundation House, this 47-room sandstone brick mansion was the home of William J. Mayo, one of the founders of the world-famous Mayo Clinic. Perched atop of “Pill Hill,” Rochester’s historic mansion district where the big money from Mayo Clinic went to build, the Tudor-style Mayo House features an imposing 5-story square tower on its facade. 139. 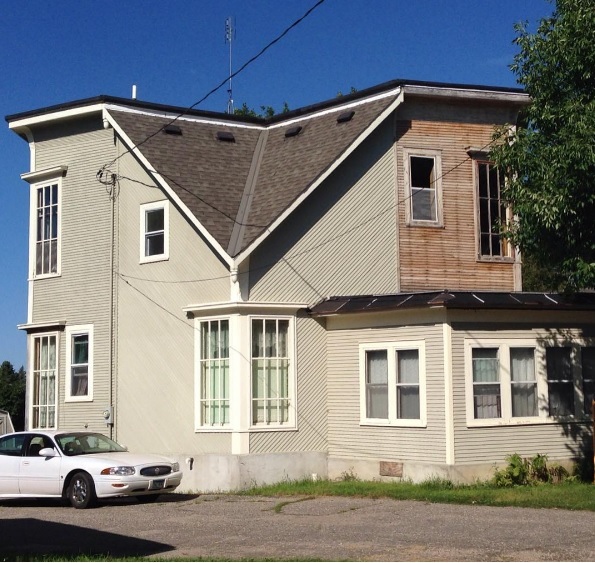 John B. Johnson House, Osakis – This unusual hexagonal-shaped house in Osakis (just east of Alexandria), features a bizarre inverted roof line that was originally designed to withstand high winds. 138. Milo White House, Chatfield – A beautiful, brick-built Queen Anne Victorian home in southern Minnesota’s Chatfield, the Milo White House was built in 1871 for local mercantile businessman Milo White. White was eventually Chatfield’s mayor, and also a successful Minnesota Congressmen in later years. 137. 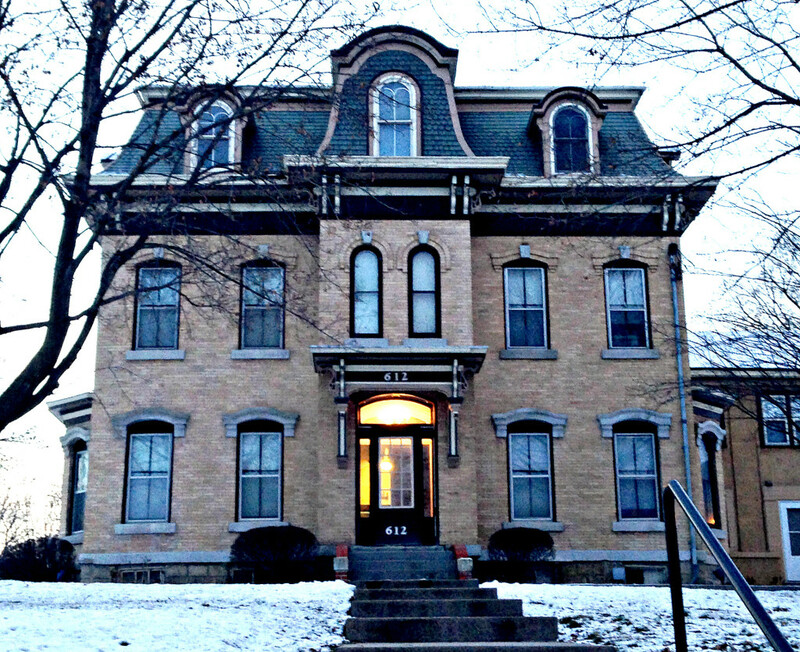 George Doehne House, New Ulm – One of eight architecturally significant homes in New Ulm’s South German Street Historic District, the George Doehne House features a Mansard-style roof, French Second Empire architecture, Eastlake-styled detailing, and a peaked dormer on its central wall. The home was built in 1884 and is listed on the National Register of Historic Places. 136. 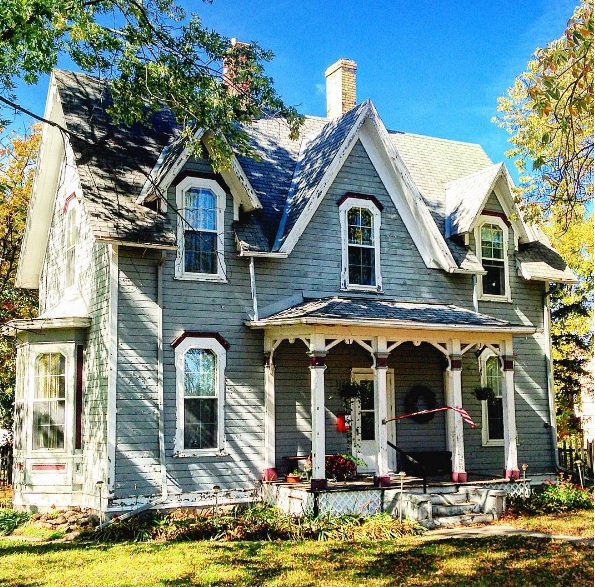 Ticknor House, Anoka – The Ticknor House in Anoka was owned by three generations of a family in Anoka’s early years. 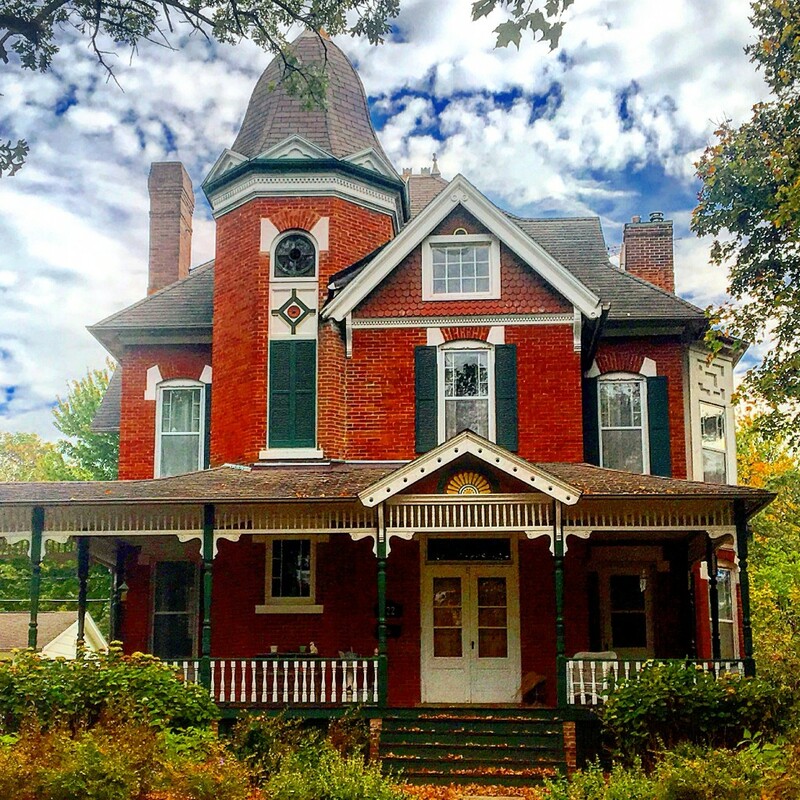 Its core was built back in 1867 in a Gothic design, and a later addition in 1903 utilized the Queen Anne style with its turret, porch, and attached carriage port. 135. 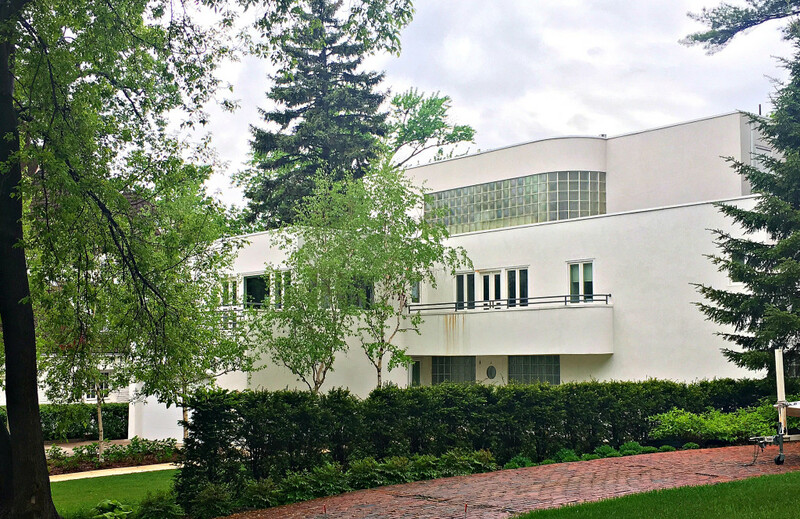 Kaufman/Lacey House, Cedar Lake, Minneapolis – The first International-style Home in Minneapolis (which is said to be the basis of Art Deco/Art Moderne style), the home was built for V. Mel Kaufman in 1936. A third story was added in later years. In 1987, it was designated a landmark by the Minneapolis Heritage Preservation Commission for its architectural significance. 134. 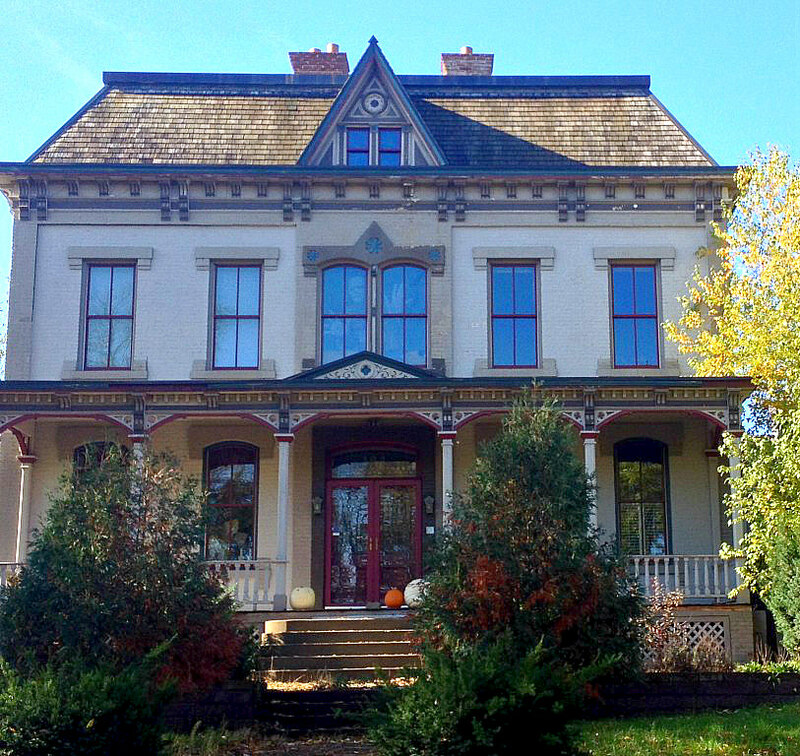 Thorne/Lowell House, Hastings – The Thorne/Howell House was built in 1861 with limestone brick in the Italianate-style with a distinct square cupola on top. Hastings’ West Second Street District contains 13 architecturally significant historic homes in varying styles. 133. 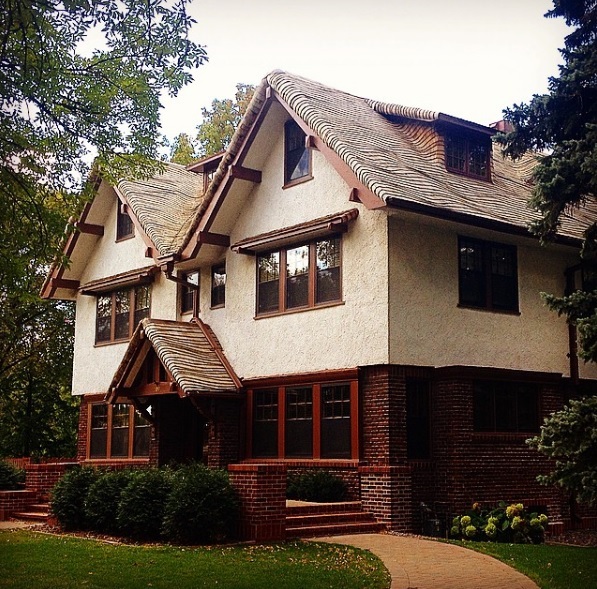 1314 Mount Curve Dr, Minneapolis – Designed by architect by William Kenyon in 1931, this beautiful Tudor home in Minneapolis’ historic Lowry Hill neighborhood has had only 3 owners in its life. It was built with half-timber-and-stucco and leaded windows and stands tall on hill with views of downtown Minneapolis. 132. Capt. Austin Jenks House, Stillwater – Austin Jenks was a prominent businessman and river pilot during Stillwater’s early logging days and built this architectural brick beauty around 1878. 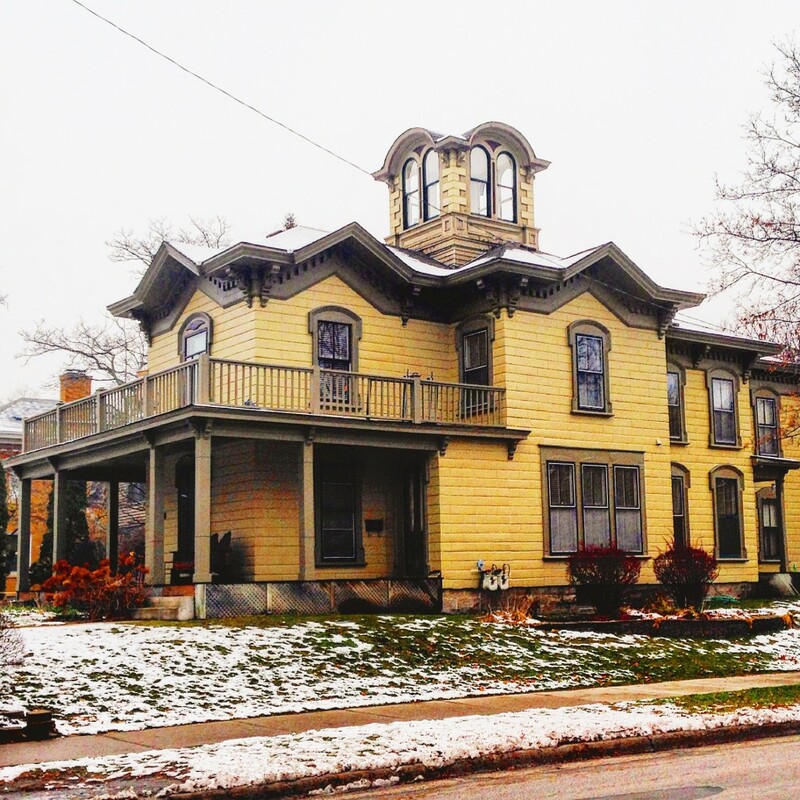 It showcases three different building styles- Italianate, Carpenter Gothic, and French Second Empire. It is listed on the National Register of Historic places for its historic and cultural significance. 131. John Allen House, Minneapolis – Lake of the Isles, in Minneapolis’ Chain of Lakes, is surrounded by beautiful, historic homes. Built in 1920, the John Allen house is a Renaissance-style mansion overlooking the elegant Lake of the Isles from the west. 131. 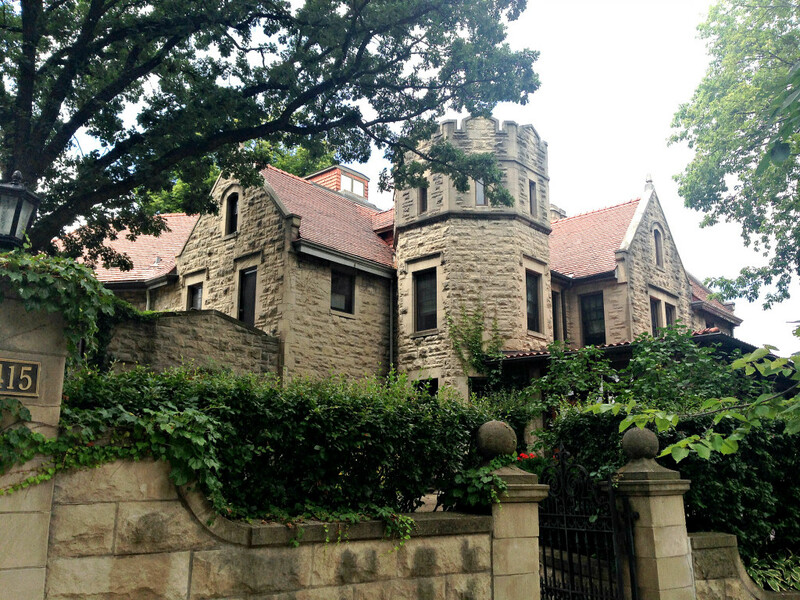 A. R. Rogers House – Minneapolis – A beautiful castle nestled among the mansions of Lowry Hill in Minneapolis, the A. R. Rogers House features a crenelated tower with parapets on top, stone gates and carriage house, and was designed by legendary architect William Channing Whitney, who built many significant homes and buildings in Minneapolis. 130. 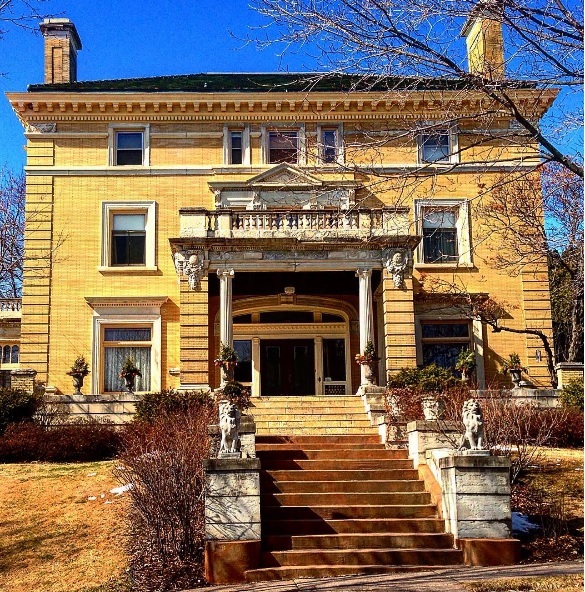 William R. Marshall Home, St. Paul – This Queen Anne-style home was built for William R. Marshall in 1891 who had served as MN’s Governor from 1866-70 after serving in the Civil War. The neighboring home was built for Captain J.W. Jacobs in 1891 who is said to have served with Marshall in the US Army. Marshall Street in St. Paul is named after him. 129. 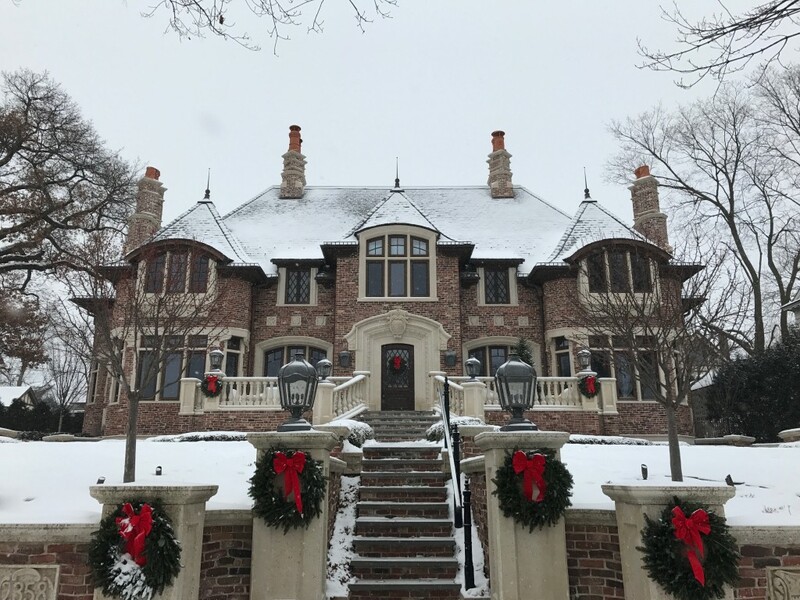 Southways, Orono – The biggest, baddest, most over-the-top, Cribs-worthy mansion in the entire state is of course found where the rich folks go to play, Lake Minnetonka. The opulent Pillsbury Mansion (yes, that Pillsbury), also known as “Southways,” sits on 1100 feet of lakeshore on its own private peninsula, and the pictures on the real estate website listing it for many millions of dollars remind us of a lifestyle most of us can only dream of. The home was built in 1918 for the Pillsbury family in the English Tudor-style of architecture, it features indoor and outdoor pools and just about everything else you’d imagine. 128. 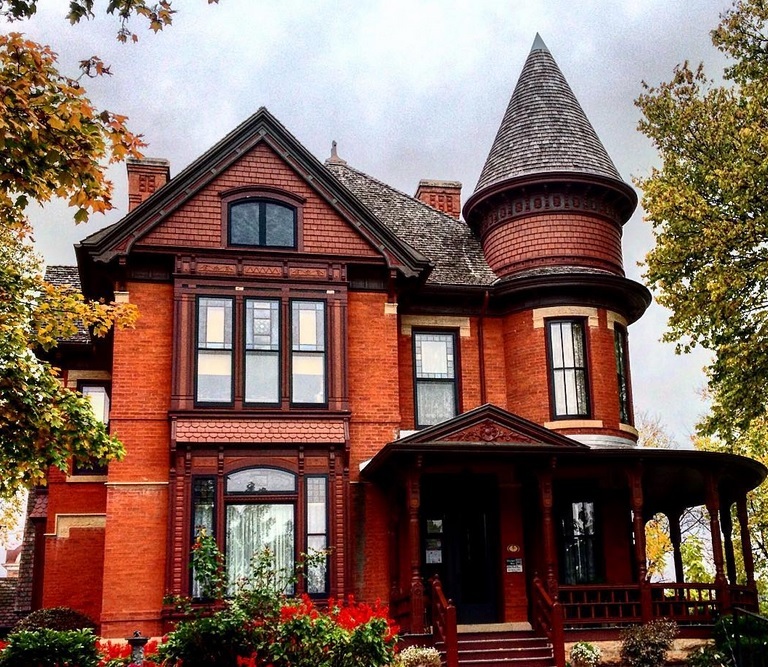 Cyrus Thurston House, St. Paul – This Summit Avenue beauty in St. Paul was built by Cyrus Thurston in 1881 in the Queen Anne style of Victorian Architecture. 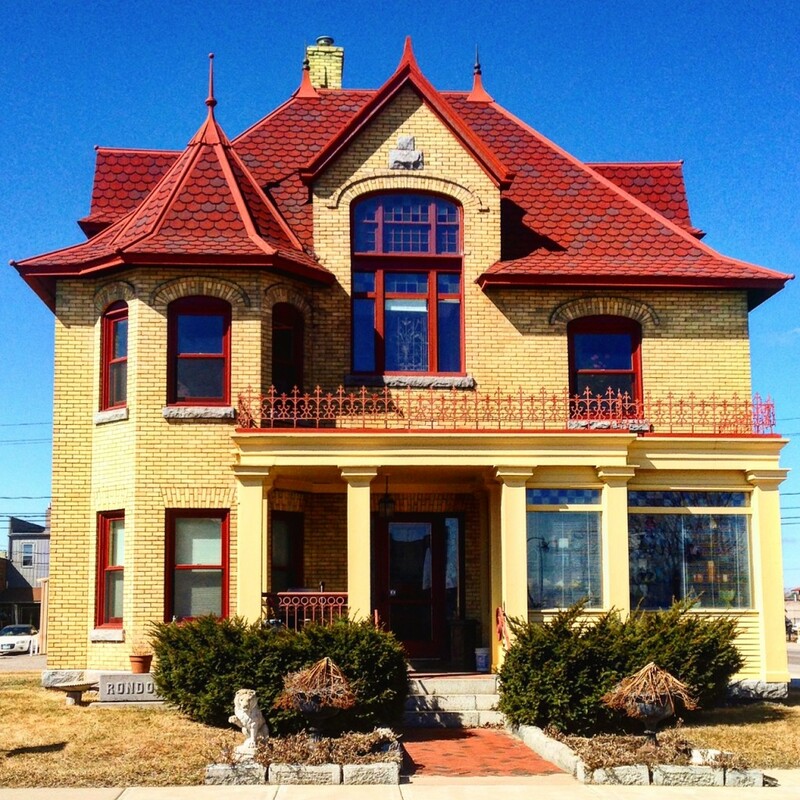 It features multiple peaked dormers and gables, bay windows, and elaborate trim details. Thurston was a businessman involved in farm implements and cold storage. 127. 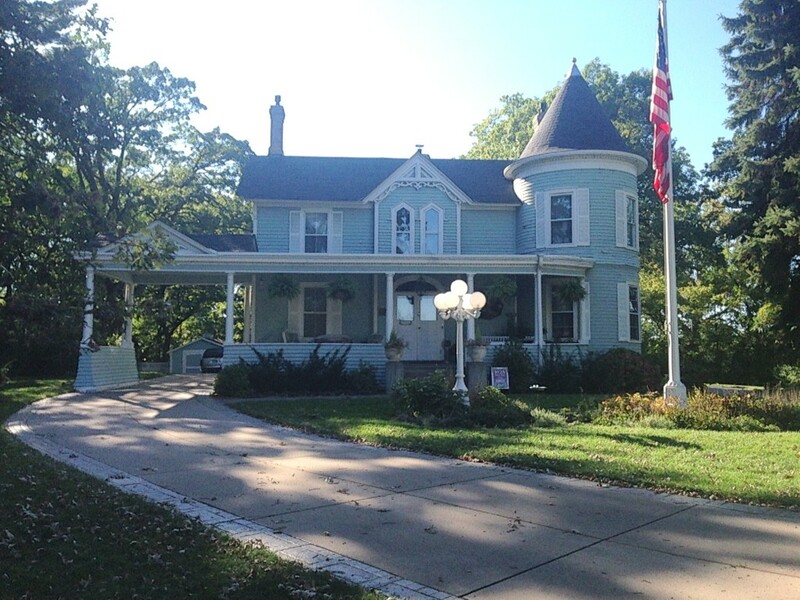 Reuben Freeman House, Inver Grove Heights – This bizarre, 8-gabled home in a secluded area of Inver Grove Heights (south of St. Paul) near the Mississippi River was built with local fieldstone back in 1875. The upper windows were adorned with bottle glass to give it an even further unique appearance. 126. 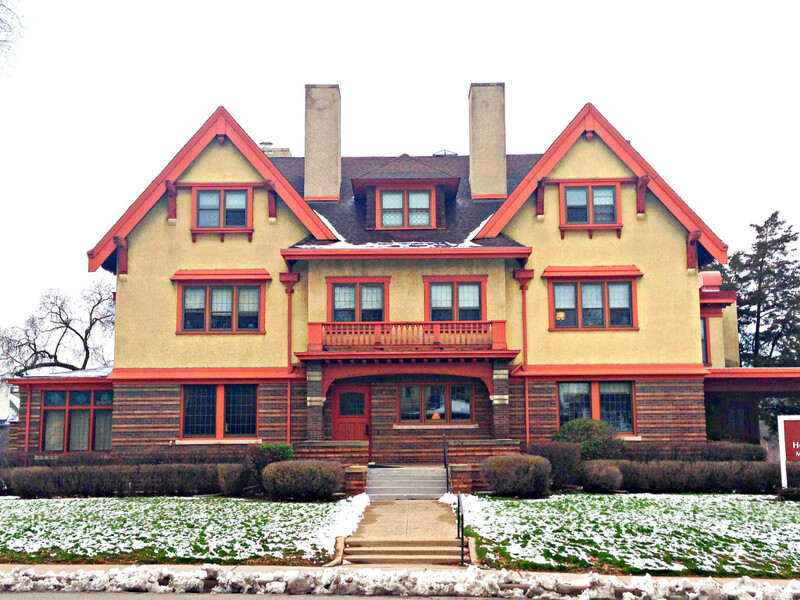 Edwin H. Hewitt House, Minneapolis – Edwin H. Hewitt was a famous Minnesota architect who designed many famous landmark buildings in Minneapolis in the early 1900’s. His house, which he built in 1906 in the historic Stevens Square neighborhood of Minneapolis, exhibits late 19th and early 20th-century Revival as well as Craftsman styles of architecture. 125. 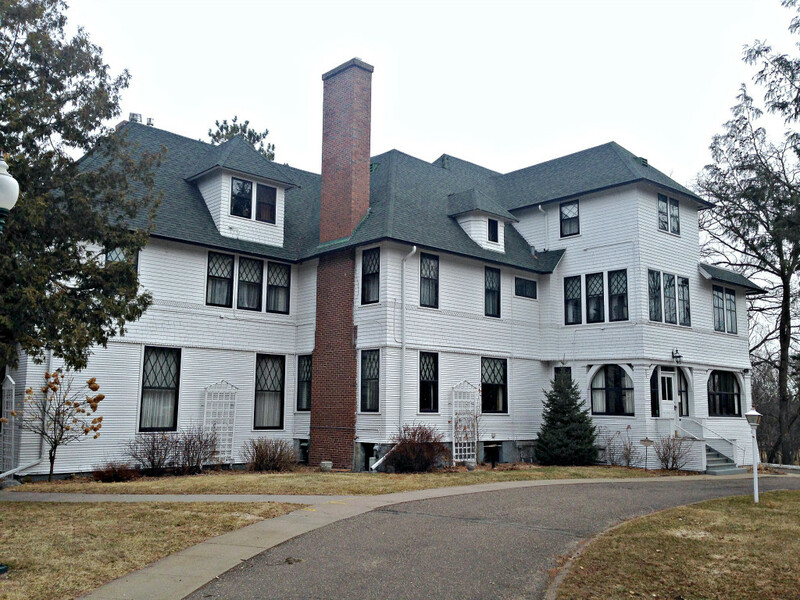 Wiliam Richardson House, Duluth – With its soaring white columns beneath its rounded front portico, the stately Richardson House in Duluth’s historic East End mansion district was built in 1908 in the Colonial Revival style of architecture for William Richardson, a prominent local attorney. 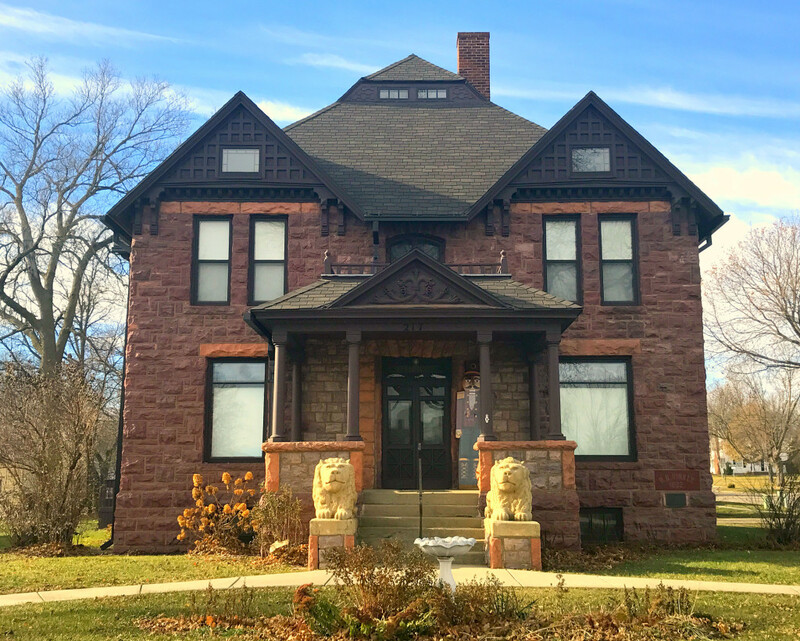 It was built by the firm of German and Lignell, who designed many homes in Duluth, many of which featured stone lion statues out front. 124. Rondorf House, Staples – Staples is a small town in north-central Minnesota between Detroit Lakes and Brainerd. The beautiful Victorian home was built in 1898 on the site of the original Staples Mill. H.L. Rondorf was an early pioneer of Staples, contributing significantly to the growth of the logging town. The yellow and red-trimmed brick home is currently being used as an antique store. (Thanks to Todd County Historical Society for the home information). 123. 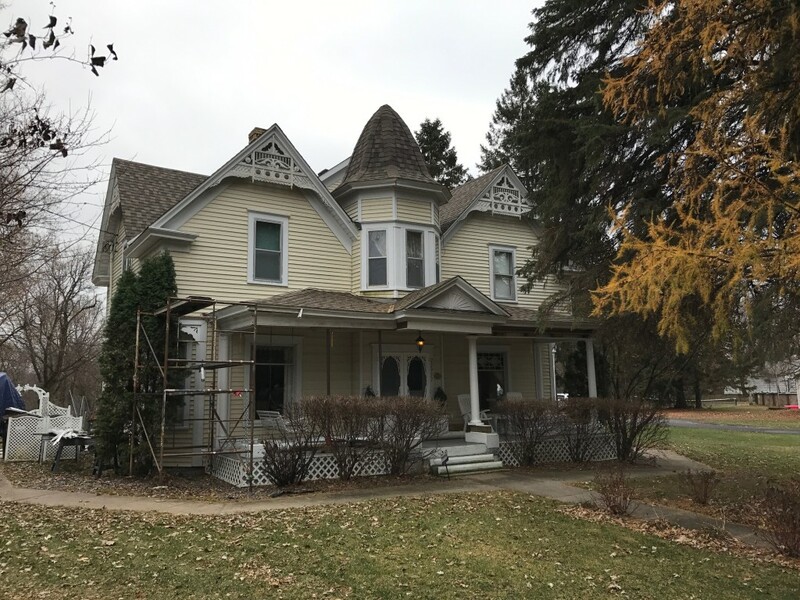 Muret Leland House, Wells – An 1883 Queen Anne/Eastlake-style home in the small town of Wells (west of Albert Lea), the Muret Leland House was originally built for a local doctor and sold 7 years later to local merchant Muret Leland. The beauty of the house is in its elaborate woodwork, a wraparound porch, and a floating turret. 122. 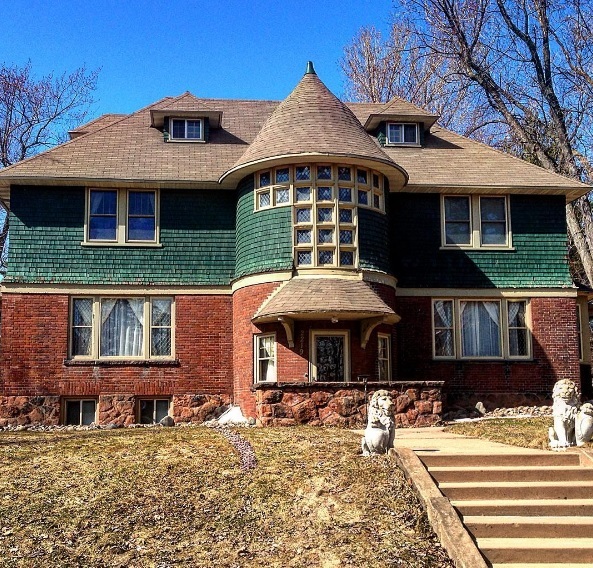 Warren McCord House, Duluth – With an impressive, towering front turret, the Shingle-style brick house is among the favorites in Duluth’s East End, guarded out front by stone lion statues. The home was built in 1903 for Warren McCord, a local banker. The diamond-beveled leaded windows form a T shape in the 3-story tower, giving it a fortress-like appearance. 121. 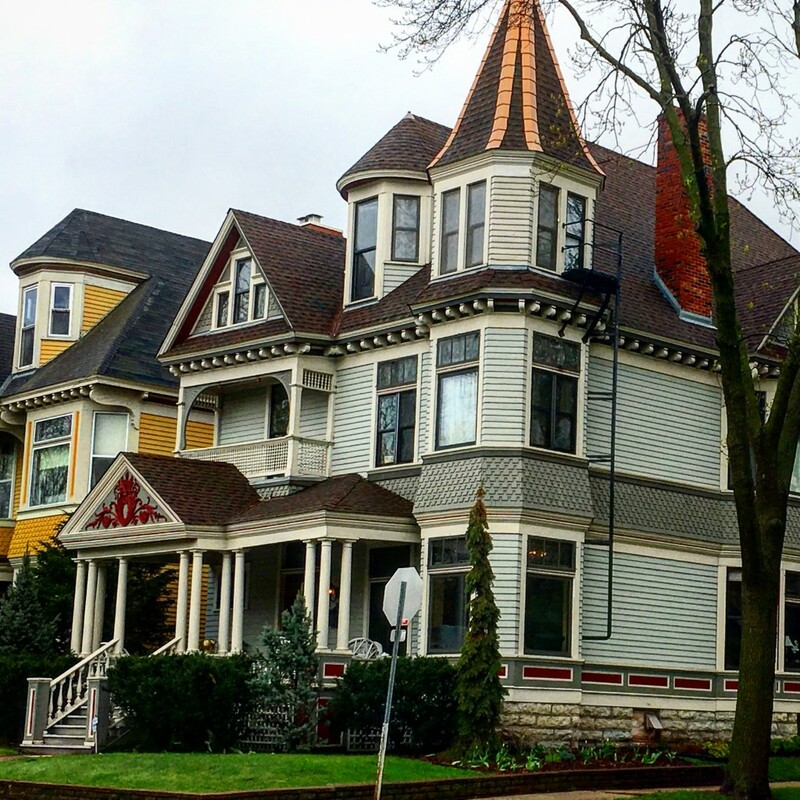 Seward House, Stillwater – This colorful Victorian home in Stillwater’s historic residential neighborhood was built in 1886 in Victorian fashion, with detailed yellow, red, and green trim, Stick-style framework, and an angled turret. It was owned by Victor Seward, who owned the local newspaper for 3 decades before he was murdered by a disgruntled employee. 120. 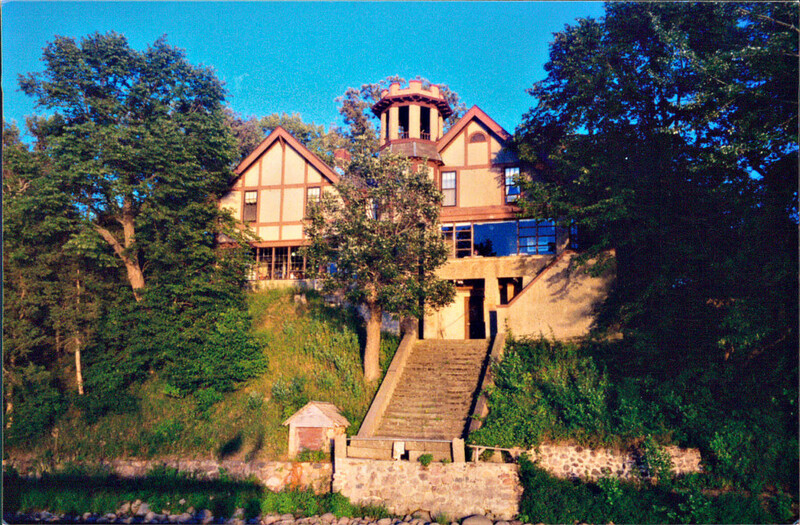 John M. Spicer House, Spicer – Also known as the Spicer Castle B&B on Green Lake outside of Willmar, the Tudor-style home on Green Lake was the original summer home of the town’s founder. 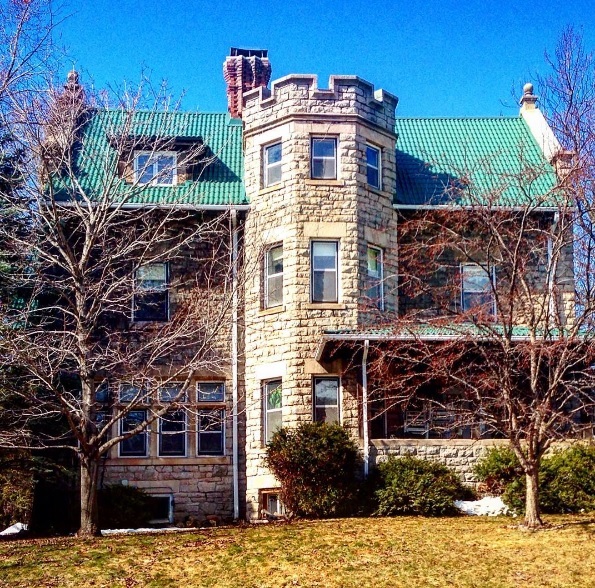 It was built in 1895 and originally known as the Medayto Cottage, but due to its castle tower on the lake side of the house, it became known over the years as the Spicer Castle. The historic home along with several small cottages around the grounds can be rented out. 119. H.G Leathers House, St. Francis – The H. G. Leathers House in St. Francis was built in 1883 and has been moved several times. 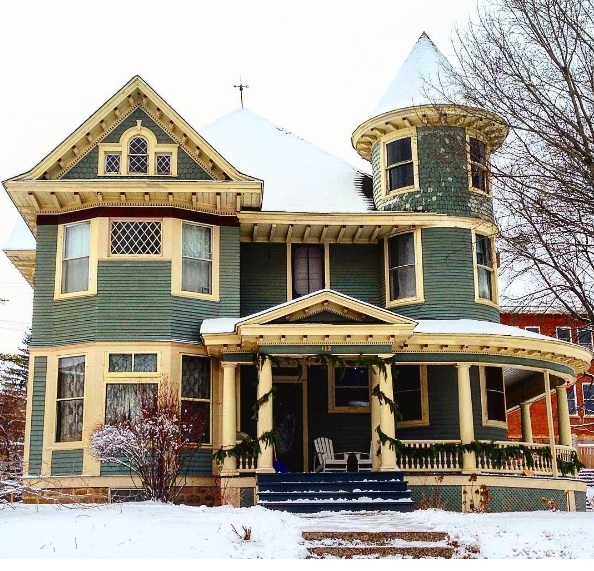 The Victorian home is one of few such homes in Anoka County and features a central turret and detailed Eastlake-style woodwork on its gabled rooflines. 118. 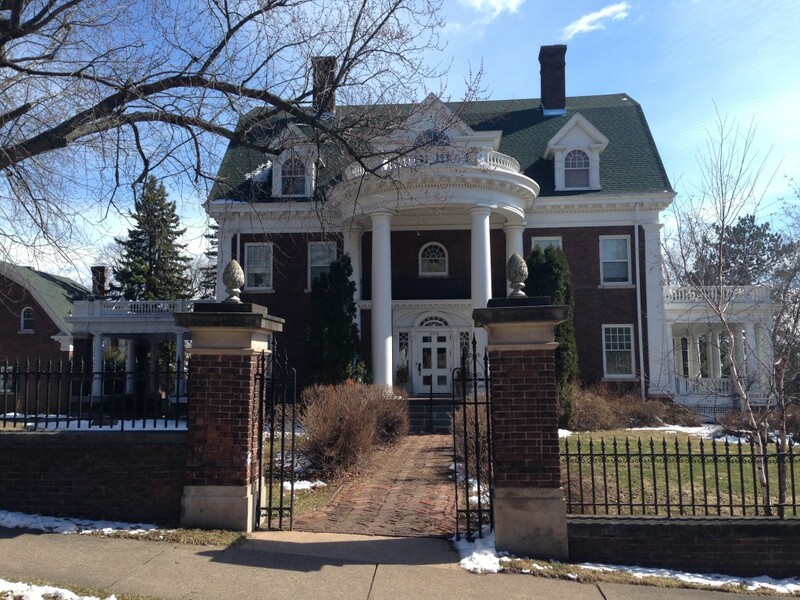 Morse House, Minneapolis – Found in the Whittier neighborhood of Minneapolis, the Elisha and Lizzie Morse Jr. House features Italian Villa style architecture with a very distinctive cupola on top. It was built all the way back in 1874, and was moved to its present residential location in later years when I-35W was built through Minneapolis. 117. 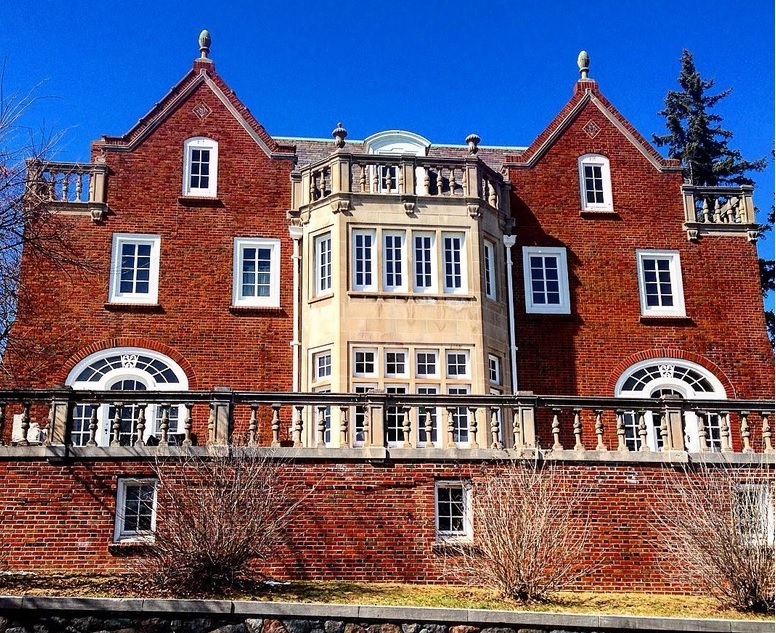 Dwight G. Cutler House, Duluth – The three-story high octagonal brick tower sets the Dwight Cutler House apart from the many other mansion’s in Duluth’s East End, giving it a castle-like appearance. 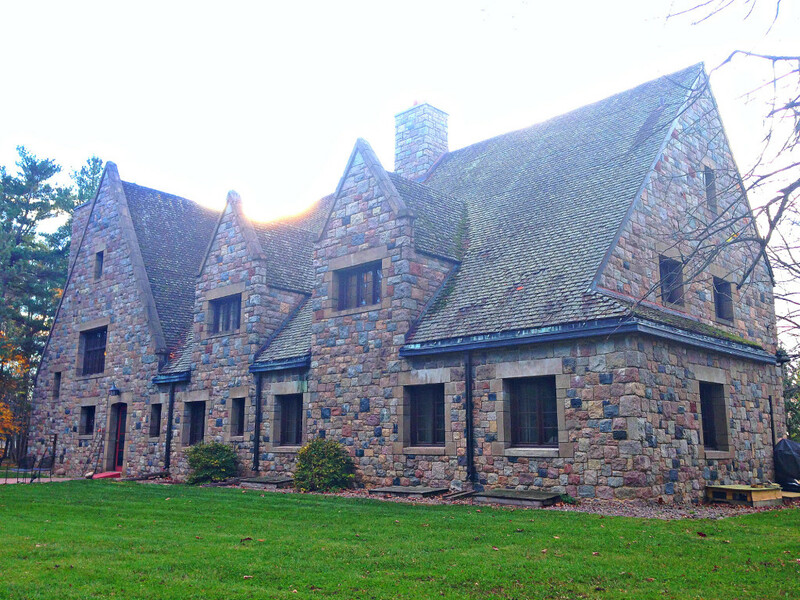 Dwight Cutler owned a building supply company during Duluth’s early 1900’s boom era and had his English Tudor-style home built with rock quarried from Lake Erie’s Kelley Island. Cutler died at the age of 38 while aboard a cruise ship. 116. 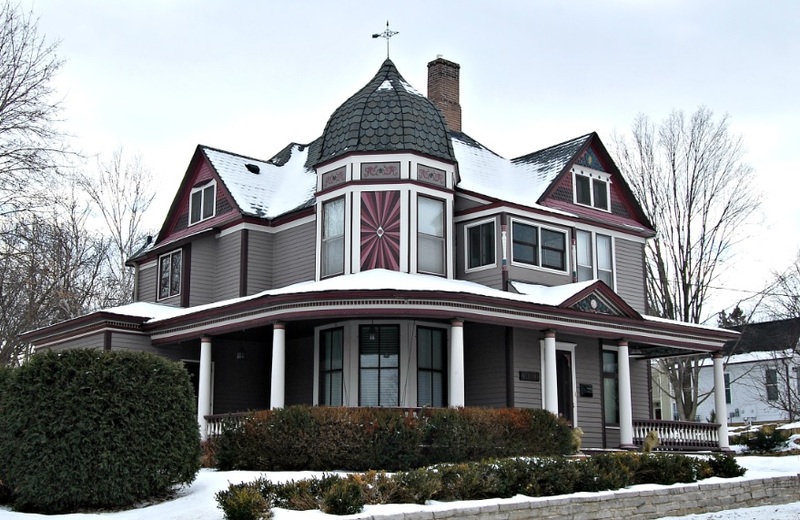 Waller House, Little Falls – Also a Bed and Breakfast, the stunning Waller House in Little Falls features a colorful design with a hexagonal turret peaking out. Built in 1897 by local banker Alexander Davidson, it changed hands many times over the next century, and by the 1990’s in was in very poor condition. The Waller family then bought it, fixed it up, and operate it as the Waller House Inn today. 115. 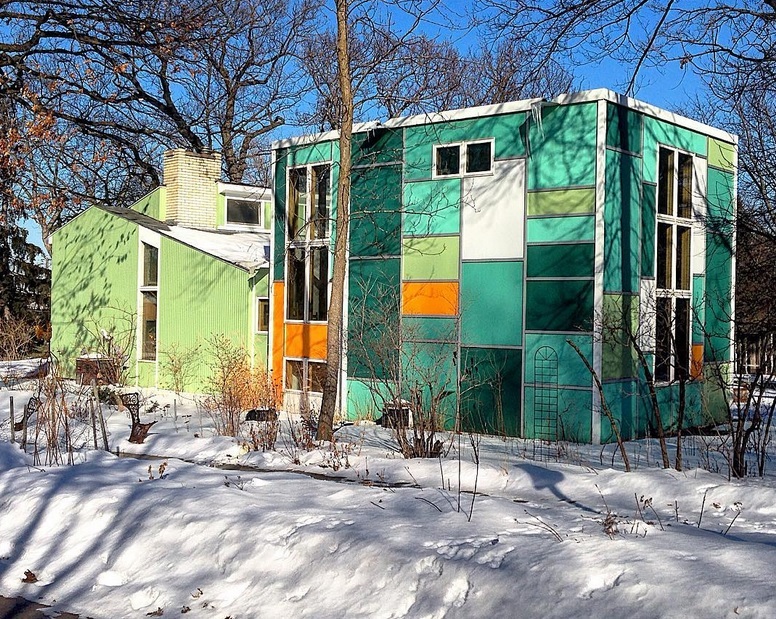 Jenkins House, Falcon Heights – One of the exemplary Mid-Century Modern homes in the architect-designed University Grove neighborhood in Falcon Heights, the Jenkins house features an attached cube-shaped library with square paneling and windows. Many of the 103 homes in the enclave were designed by renowned Mid-Mod architect Ralph Rapson. 114. 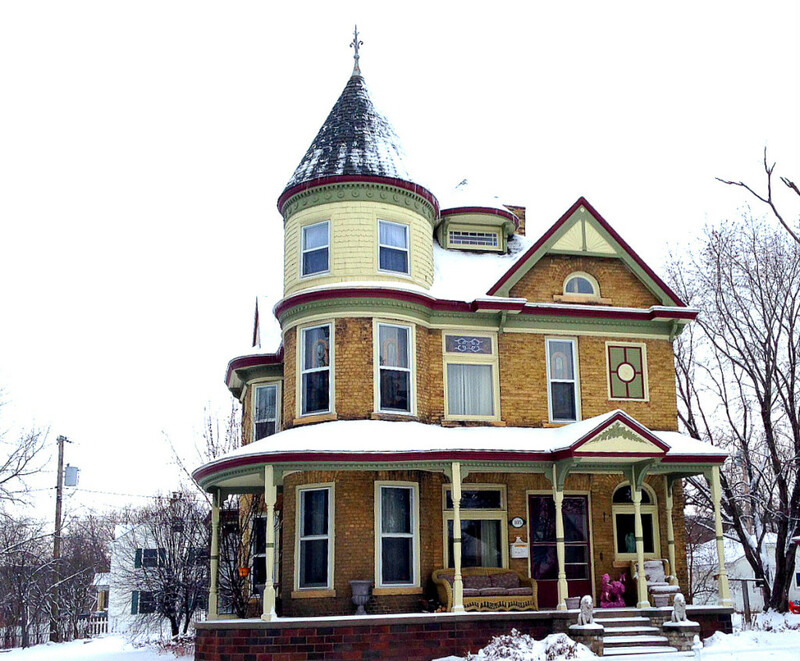 John Lind House, New Ulm – A bold, brick-built Victorian home in New Ulm, this beauty was built in 1887 at a cost of $5,000. 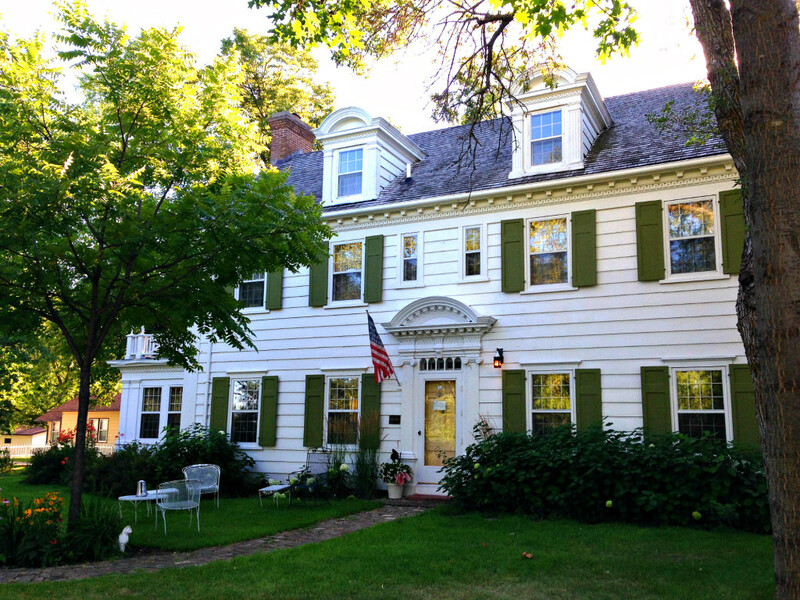 Minnesota Congressman and State Governor John Lind lived in the home in the early 1900’s before relocating to Minneapolis. The home saw several owners over the years and at one point sat vacant before a restoration began in the 1980’s. 113. 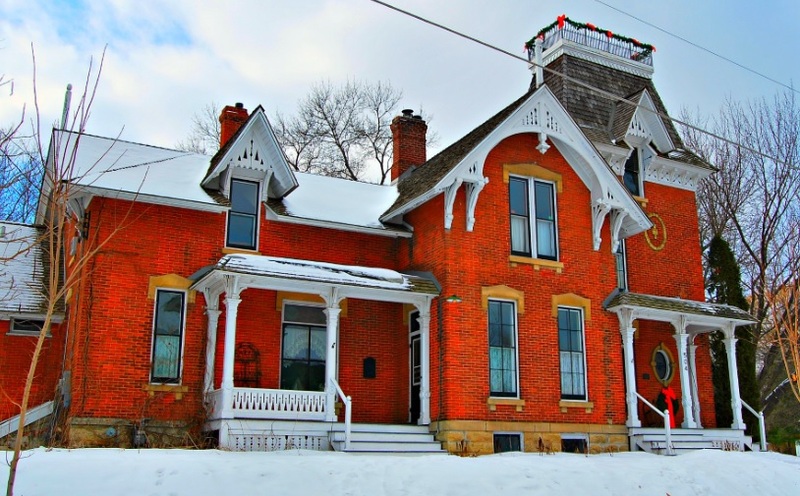 Thompson-Fasbender House, Hastings – The Thompson-Fasbender House in historic Hastings was built for a successful farm owner and businessman by the name of William Thompson back in 1880. It was later owned by a doctor named Fasbender who made several additions. 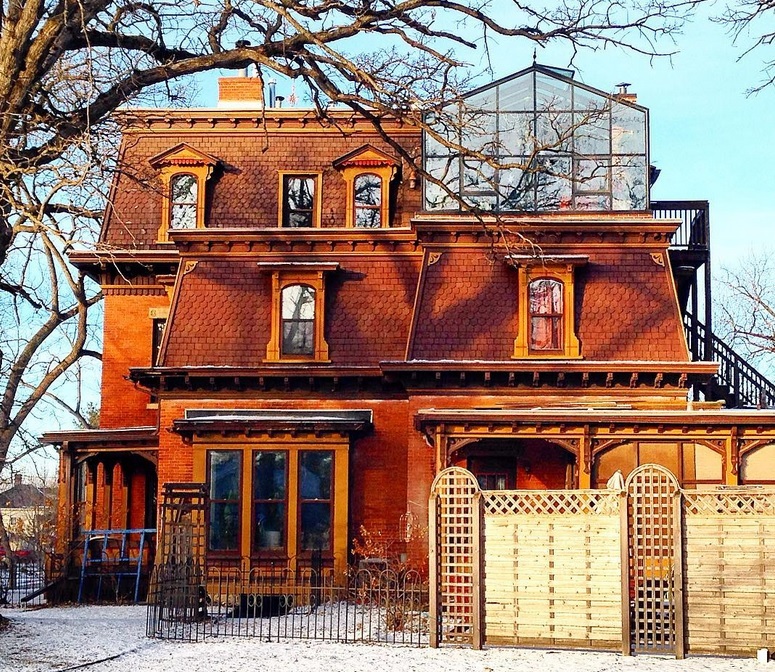 The French Second Empire-styled home features multiple Mansard-style shingled roofs and a solarium on top. It is currently in use as a B&B. 112. 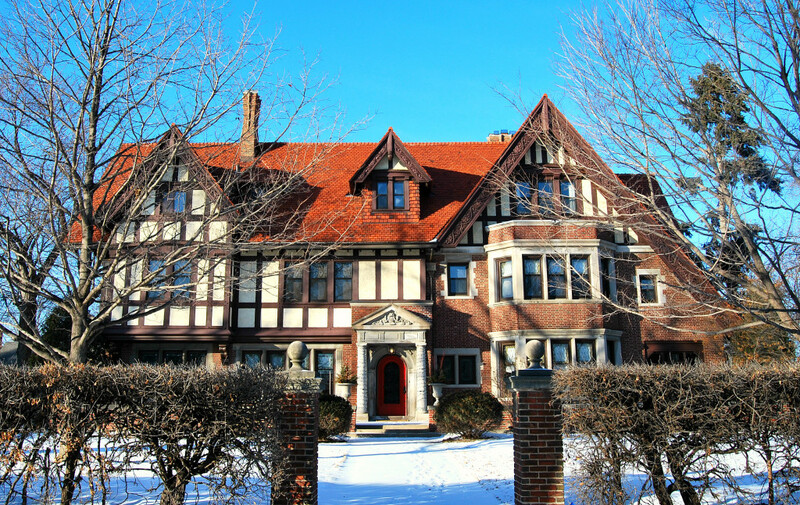 Samuel Dittenhofer House, St. Paul – Clarence Johnston, the architect of the Glensheen Mansion in Duluth, was also building this Tudor Revival-style mansion on St. Paul’s Summit Ave at the same time he was building the Glensheen. The home dates back to 1906 and is rumored to be haunted. It features multiple gables, stucco and half-timbering, and a red tile roof, all common features of the Tudor-style of English Renaissance architecture. 111. 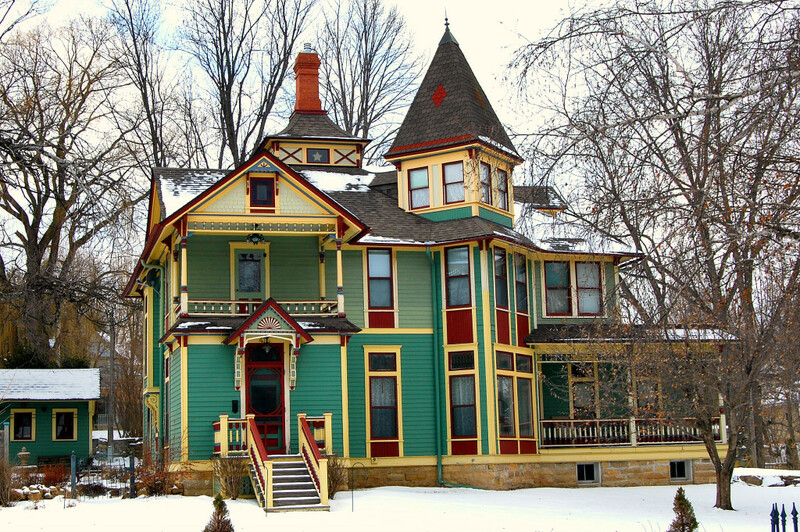 Eder-Baer House, Chaska – The stunning Queen Anne-style Baer House in Chaska features a beautiful rounded turret, a wraparound porch, stained glass windows and elaborate woodwork throughout. It was built back in 1889 and is listed on the National Register of Historic Places. 110. Olfelt House, St. Louis Park – A Frank Lloyd Wright gem that was recently up for sale, the Olfelt House is tucked away at the end of a cul-de-sac in St. Louis Park on the edge of Minneapolis. It features a dramatic, sloping roofline over the driveway, and bold, sharp angles designed to both aesthetically blend in with its surroundings and set it apart from other Mid-Century Modern architecture of the time. 109. John Williams Home, Duluth – A mini-Glensheen in Duluth’s East End mansion district, the English Revival-style Renaissance John Williams home was built in 1916 by famed architect Frederick Perkins. The house is sometimes referred to as the “Sinclair Lewis House,” as the famous Minnesota author lived here briefly in the 1940’s. 108. 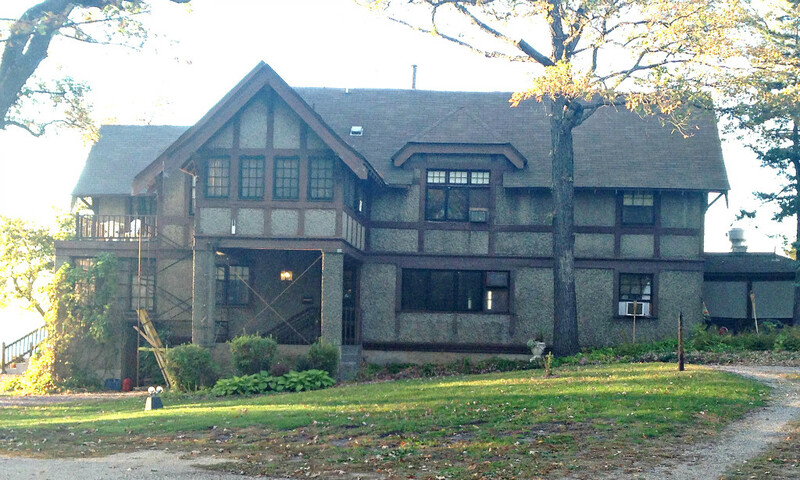 Lew A. Huntoon House, Moorhead – The only English Cottage-style home in Moorhead, the Lew A. Huntoon House is currently the official residence for the President of Concordia College. The quaint home features a twin-gabled roof, brick and stucco exterior, and a beautiful thatched roof. 107. 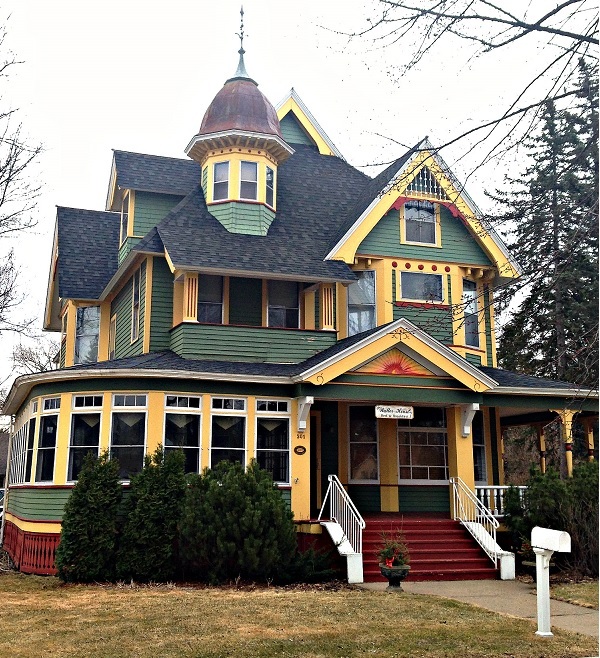 William Kirke House, St. Paul – With a big witch-hat tower and elaborate woodwork on the eaves and portico, the Carpenter Gothic-style beauty on Summit Ave was built in 1896 by architect Clarence Johnston, who designed up to 30 homes on Summit Ave alone. 106. 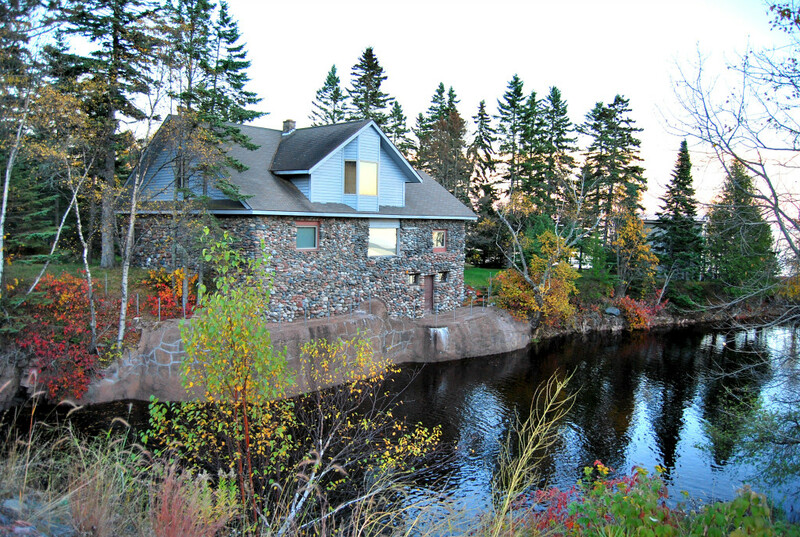 Devil Track River Stone House, Grand Marais – The beauty of this little stone house is not only its colorful rock design, but the fact that it sits literally inches away from the Devil Track River, which empties into Lake Superior a few yards away. The stonehouse is visible right off of the famous Highway 61, and reminds us of a simpler time when landowners could build as close to the water as they wanted. 105. Weyerhaueser and Musser Mansions, Little Falls – Two grand homes situated on the Mississippi River in Little Falls, the Weyerhaueser and Musser mansions were built in 1989 by lumber barons of the Pine Tree Lumber Company. The Weyerhauesers later moved on to St. Paul but the Musser family still occupied their home until about 20 years ago. 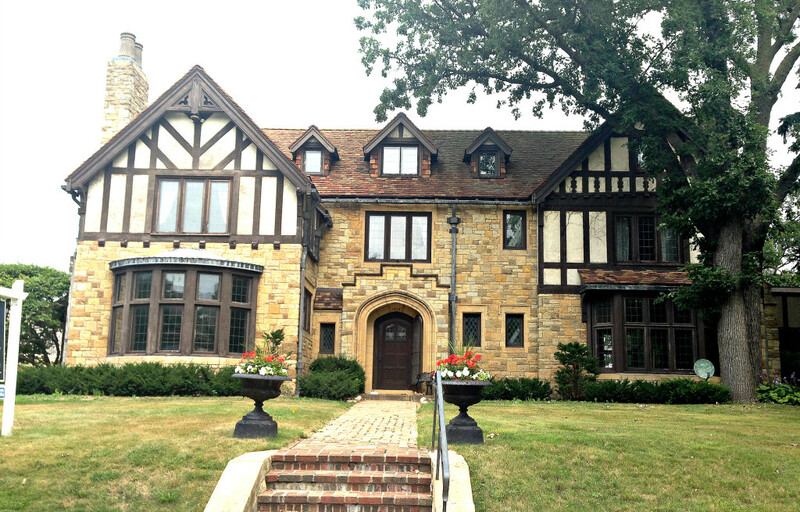 The beautiful Crafstman-style mansions are now a part of the Linden Hills Historical Event Center, a 9-acre spread that offers tours of the mansions as well as an option to rent out the place for weddings and other events. 104. 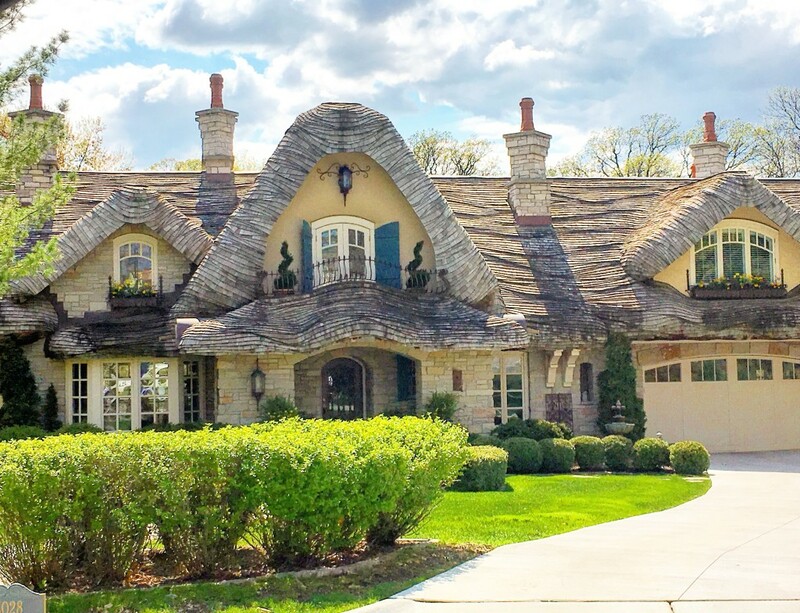 5028 Bruce Place, Edina – This incredible thatched-roof home at 5028 Bruce Place in residential Edina features Cotswold-inspired architecture commonly seen in England. 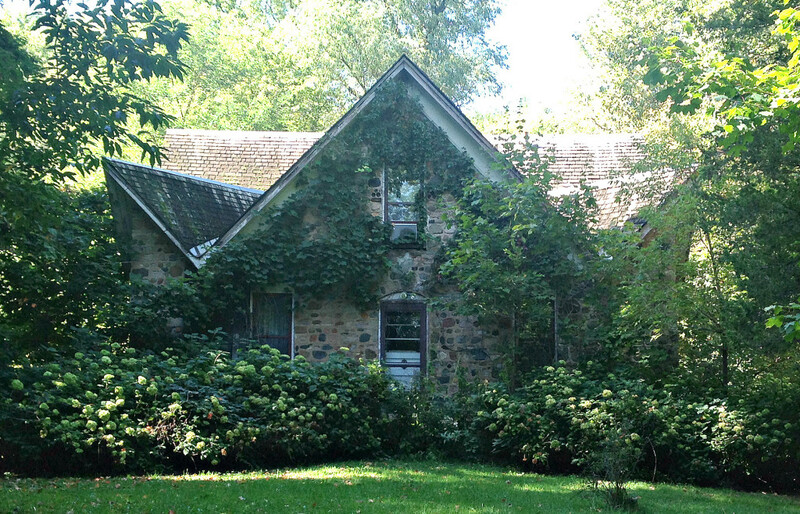 It’s situated right on Minnehaha Creek and currently for sale for anyone looking to live in a home straight out of a fairytale. It also features an outdoor pool and 6 fireplaces. 103. 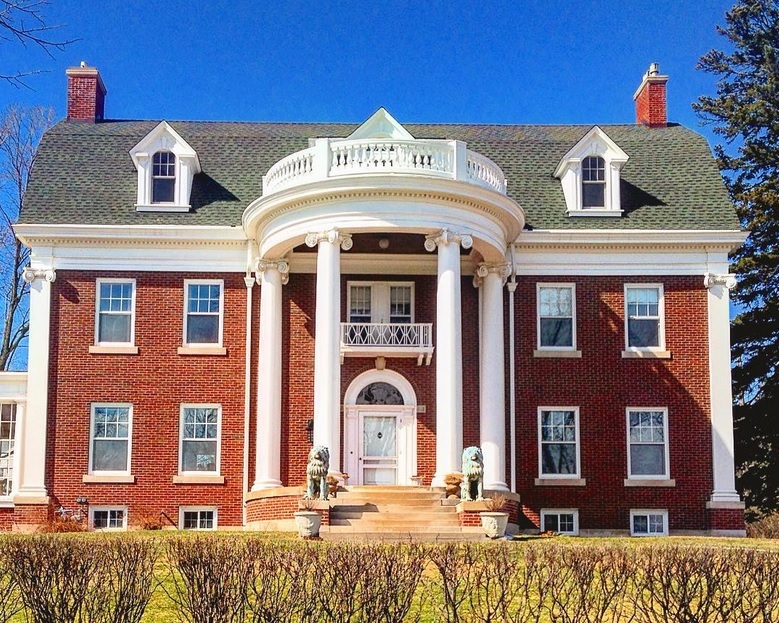 Eagle Lodge, Deerwood – This bold, English Manor-style mansion on Clearwater Lake outside of Deerwood was built back in 1924 by John Savage, a New Hampshire transplant who made his fortune in the nearby Cuyuna Iron Range mines. 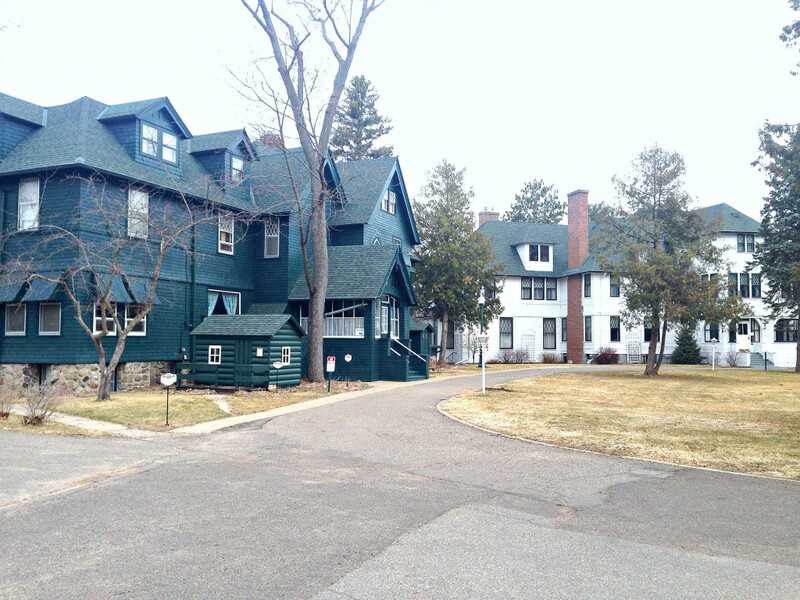 The property, along with other stone buildings and facilities, was later deeded to the Presbyterian Church, where it operates as part of a summer camp and retreat center today. 102. Hubbard House, Mankato – The Hubbard House is a French Second Empire-style house in Mankato’s historic “Silk District” alongside many other Victorian homes. Built in 1871 for Renesseleaer D. Hubbard, a player in Mankato’s prominent milling industry, it is now a museum operated by the Blue Earth County Historic Society, which later restored it to its original appearance. The Hubbard House has 18 rooms, a detached carriage house, and original antiques from its early days. 101. R.B. Hinkly House, Luverne – R. B. Hinkly, mayor of the town of Luverne (near Pipestone), decided to build a home for his family back in 1892 with locally quarried red Sioux Quartzite from what is now Blue Mound State Park. The brick home features detailed trim work, stone lion statues, and the basement even has a secret dynamite storage vault. In later years, the home was deeded to the Rock County Historical Society who set off to restore it to its original beauty. Tours are available in warmer months. Click here to find out the Top 100!